(a) Optical image of the sole of a gecko’s foot sole, and (b) scanning electron microscope image of setal array. Reprinted by permission from Macmillan Publishers Ltd: Nature Communications, 6: 8949, copyright (2015). The extraordinary ability of the gecko to run across any surface—smooth or rough, clean or dirty, vertical or inverted—has long fascinated scientists. 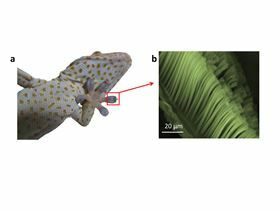 Now a team of researchers from the USA and China have cracked the gecko’s secret and developed a micromanipulator that mimics its ability [Xu et al., Nature Communications (2015) 6: 8949, DOI: 10.1038/ncomms9949]. Geckos achieve such remarkable climbing antics because of their sticky feet, which can grip any surface wet or dry. Yet, despite the stickiness of geckos’ feet, they do not become covered in dirt. This self-cleaning ability has been attributed to the unique structure of the gecko foot, the toes of which are covered with setae 140 microns long and 4 microns in diameter that branch into nanoscale spatulae 10 nm thick, 200 nm wide, and 300 nm long. These spatulae, which are made out of nail-like keratin material, work in unison to generate van der Waals forces that taken together can produce adhesive forces of up to 15 nN—enough to support the gecko’s weight many times over. By simulating how an individual spatula moves in an atomic force microscope, the researchers discovered that dirt particles detach easily from setae when the gecko peels its toes away from a surface at high speed as it runs along. The pull-off velocity produced as the gecko extends its foot appears to be enough to dislodge any dirt particles adhering to the setae. ‘‘This distinctive dynamic behavior of gecko setae and spatulae provides critical design principles for the development of robust self-cleaning systems,’’ says Xia. Together with colleagues from China University of Petroleum in Beijing, Tsinghua University, Northwestern Polytechnical University in Xi’an, University of Denver, The University of Akron, and Case Western Reserve University, Xia created a micromanipulator that mimics these unique capabilities. The artificial plate-headed setae are fabricated from polyester microfibers 10m in diameter. Tiny wrinkled graphene multilayers, 5 nm thick, are glued onto the ends of 150-micron long microfibers to mimic spatulae. The micromanipulator can pick up microspheres from various substrates, move and release or assemble the particles wherever required simply by varying the pull-off velocity. In general, better understanding of the gecko’s selfcleaning mechanism could have significant impact on the development of many bio-inspired technologies from antifouling surfaces to medical and MEMS devices.